Goals from Stefanie van de Gragt, Vivianne Miedema, Melanie Leupolz and Melanie Behringer sees Bayern beat Hibernian 6-0. The game saw the first ever Champions League game played at Easter Road and they were supported by 2,551 fans. Hibernian: Fife; Williamson (Brownlie, min.82), Hunter, Murray (c), Smith; Graham, Robertson, Cornet (Small, min.69); McLauchlan, Harrison (Ewens, min.69), Arnot. Bayern Munich: Korpela; Schnaderbeck, Holstad, van der Gragt, Lewandowski; Leupolz, Behringer, Däbritz (Falknor, min.76); Evans, Miedema (Rolser, min.65), Faisst (Gerhardt, min.65). SCORE: 0-1, min. 6, van der Gragt. 0-2, min. 26, Miedema. 0-3, min.38, Leupolz. 0-4, min.57, Miedema. 0-5, min.63, Leupolz. 0-6, min. 67, Behringer pen. REFEREE: Eshter Staubli (SUI). Booked: Graham (min. 66). INCIDENTS: UEFA Women's Champions Round of 32 First Leg between SWPL Cup Winners, Hibernian, and Frauen-Bundesliga Champions, Bayern Munich. The match was played at Easter Road. 2,551 spectators. Hibernian's return to the European stage may have ended badly in terms of the scoreline, however, they can be proud of the game in terms of their spirit and how they put themselves around. Bayern München's superiority in both terms of players who have won Euros, World Cups and Olympics as well as their experience in a more competitive league told from the start, but Hibernian never gave up and stuck to their task. Nothing should be taken from the fact 2,551 fans turned up to Easter Road. Before the game, both Head Coach Chris Roberts and captain Joelle Murray had spoken about defending as a unit and it wasn't long until that was on show with Lucy Graham nearly managing to draw an error from Stefanie van der Gragt. Roberts had also spoken about learning from the game, and the main area where Bayern dominated Hibs was down the wings, with their physicality causing the home side issues with crosses and corners. Hibs' front three of Rachel McLauchlan, Abi Harrison and Lizzie Arnot pressed the Bayern defence from the start and that symbolised the way the Edinburgh side went about their job. The opener came from a corner with Verena Faisst floating her delivery to the far post, picking out Stefanie van der Gragt at the far post whose header gave Hibs' keeper Jenna Fife no chance. Scottish international Lisa Evans was using her pace to cause Hibs problems with her cross finding Vivianne Miedema but her looping header was well saved by Fife. 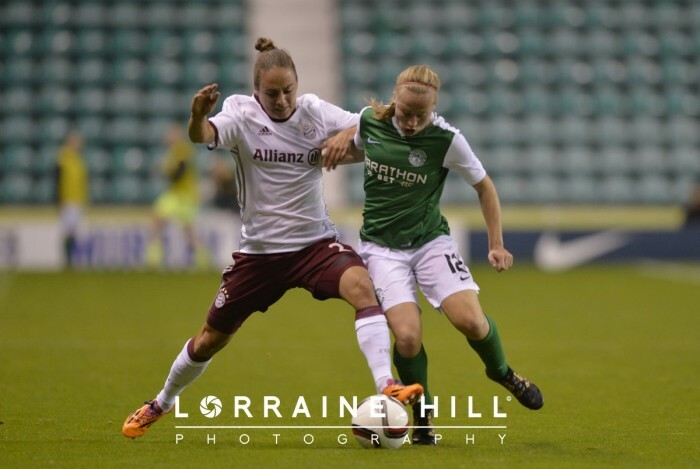 Hibernian brought the Easter Road crowd to life when McLauchlan won the ball on the wing and crossed it to Harrison, but the striker couldn't make a clean connection with her shot. Faisst's corner could have doubled their lead, but luckily for Hibs, Gina Lewandowski headed just over. When Bayern was trying to break through the middle of the Hibs defence, they were finding the partnership of Siobhan Hunter and Joelle Murray making crucial tackles. Just to emphasise how Bayern was threatening more from the wings, they came close once again from a corner. Melanie Behringer's delivery eventually fell to van der Gragt whose first effort hit the crossbar, and then Miedema fired the rebound over the bar. A goalkeeping error could have seen Bayern score their second goal with a wicked deflection of Faisst deceiving Fife and the ball bounced over her head giving Miedema an empty goal to score into, but the Dutch striker was denied by Murray's stunning goal-line clearance. Lizzie Arnot had Hibs' first chance when she picked up the ball and ran at the defence, with her long-range effort forcing Tinja-Riikka Korpela into a good save. However, finally Bayern München did get their second goal, but through the middle. Sara Däbritz's through-ball split the Hibs' centre-backs, finding Miedema in the box and she blasted the ball into the roof of the net. Bayern's threat returned to the wings with Nora Berge Holstad and Behringer coming close, and the Germans' third came from another corner. It was originally cleared, and eventually, Faisst crossed the ball back into the box and Melanie Leupolz headed in at the near post. Hibs had a positive start to the second half with Arnot causing problems down the left and moments where Abi Harrison was nearly sent behind the defence. But soon Bayern found their feet again and Däbritz came close when she span her marker on the edge of the box, but her effort hit the side netting. And then they scored their fourth. Evans' trickery down the right saw her break into the box and set up Miedema with a tap-in. Six minutes later, it was 5-0. Behringer's corner found Lewandowski whose header was cleared off the line by Clare Williamson and eventually Leupolz was there to score. Seconds after coming on, Anna Gerhardt nearly made the perfect impact. Leupolz had a shot parried by Jenna Fife towards Gerhardt, but Fife made a stunning save to deny the substitute. Then Bayern scored their sixth and final goal. Behringer's corner fell to van der Gragt whose shot hit the hand of Lucy Graham – and the referee pointed to the spot. Behringer took it, and she sent Fife the wrong way – but was lucky to see the ball deflect off both posts before crossing the line. Bayern's subs linked up and nearly led to a seventh goal when Nicole Rolser set up Gerhardt with a tap-in, but Fife made a magnificent save to deny her. It was Hibs' turn for a substitute to nearly have an impact on the score, but not the one they would have wanted. Seconds after coming on, Emma Brownlie tripped Leupolz in the box, but Rolser's penalty smashed off the underside of the bar. But what summed up Hibernian was the fact in the 92nd minute, Siobhan Hunter made a last-ditch tackle ​to prevent Leupolz from having a shot on goal. Despite the score, despite the difference between the sides – Hibs never gave up.